Liquidcaine during procedure anesthetic 60ml. Liquidcaine is a single "caine" 4% lidocaine solution.It is used to produce numbing within 90 seconds of application.It can be applied during all tattooing, piercing and permanent makeup, procedures involving, broken skin, as well as for electrolysis and laser treatment, and even to relieve the pain of sunburn.Liquidcaine should..
Prepcaine Pre-Procedure Anesthetic 35 ml. 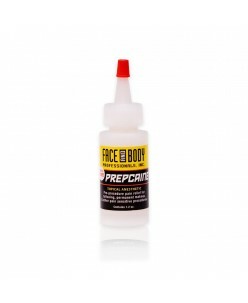 Apply Prepcaine® to unbroken skin BEFORE tattooing, permanent makeup, electrolysis or other sensitive procedures. It is effective in numbing prior to all permanent makeup procedures and it reduces sensation on tattoo procedures performed on sensitive areas of skin. 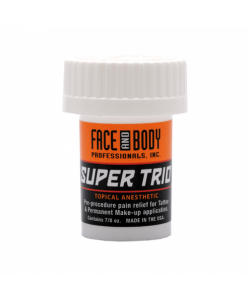 This handy to use bottle contains 2% lidocaine and 1..
Super Trio® is our most powerful pre-procedure topical anesthetic for numbing. This 4% lidocaine, 2% tetracaine, 12% benzocaine cream topical anesthetic is for use BEFORE A SENSITIVE PROCEDURE. This topical anesthetic is effective for the initial outlining of a tattoo or the first pass on a permanent makeup..
SUSTAINE® anesthetic (35ml.) 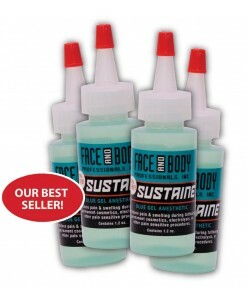 Sustaine Blue Gel® is an incredibly powerful during procedure numbing product. When used after outlining a tattoo, during permanent makeup application, electrolysis or other sensitive skin procedures to desensitize the area for completion of work. 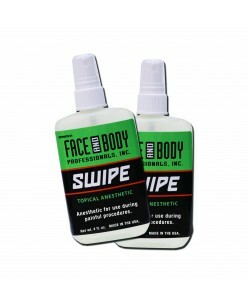 This powerful topical anesthetic c..
SWIPE is a very effective product providing quick- numbing during the procedure. Swipe contains the powerful local anesthetics 2% lidocaine, 1.5% tretracaine, and 6% benzocaine. Swipe acts usually within 90 seconds and will provide effective skin deadening lasting up to an hour. Swipe can be used continuous..